The following article, written by Senior Associate Johnathan Law, is part of an ongoing series that focuses on a select topic of inspiration for the month. The focus for July is “Transformation”. Making an investment in Complete Street Design can have a big impact upon city life and its economy. Creating an easier way for residents and visitors to take transit, walk, or bike to their destinations can help stimulate the local economy in many ways. Providing viable and safe transit alternatives saves consumers money, which in turn can be reinvested by consumers into local businesses. Also, creating an infrastructure that reduces traffic congestion and offers greater transit options allows employees to get to work and consumers to reach their retail destination more easily, contributing to a happy bottom line for small business owners. Complete Streets often spur private investment, as investors are drawn to areas featuring greater pedestrian traffic. Well-designed pedestrian environments typically generate greater consumer activity, and in turn lead to increased property values along the street. 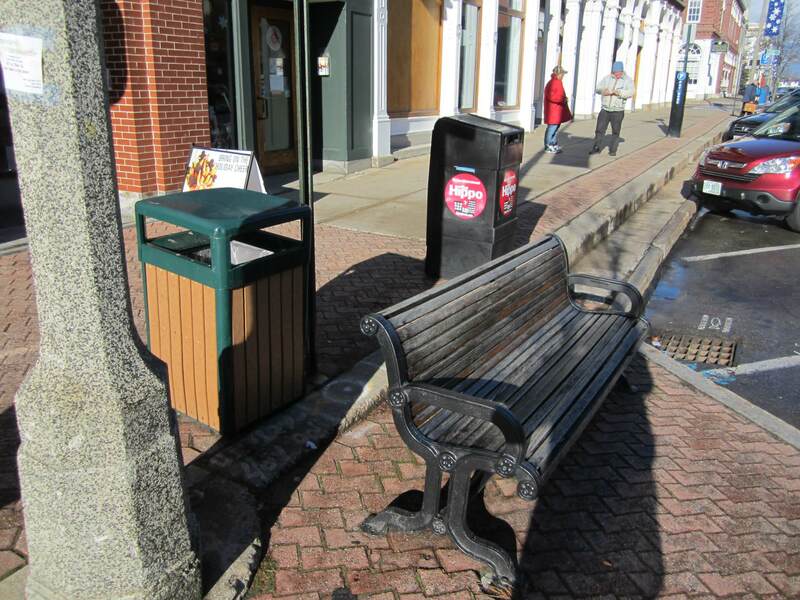 We have seen this transformation through one of our most recently completed projects: Concord New Hampshire’s Main Street Improvements. 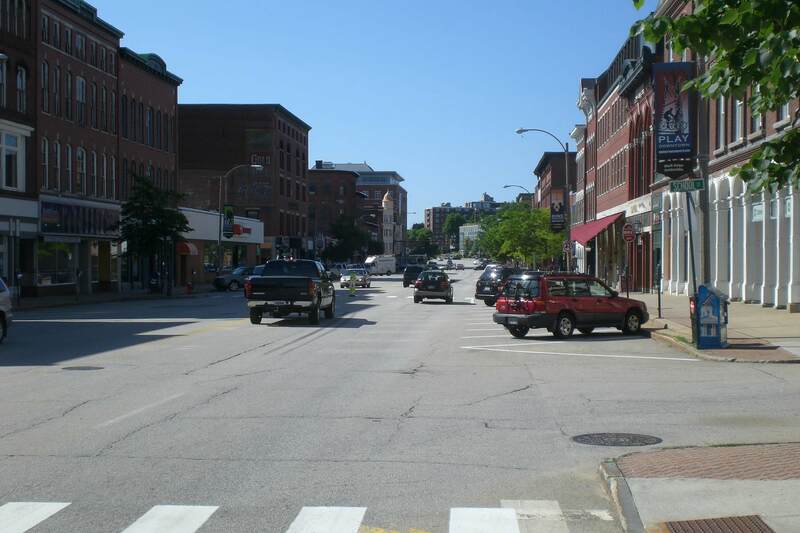 Prior to our work, the original streetscape in downtown Concord was dominated by vehicular traffic and unwelcoming to pedestrians. Years of neglect and deferred maintenance resulted in business closings and many empty store fronts. Pedestrians faced challenges trying to navigate through inaccessible, broken, treeless and narrow sidewalks. Crossing four lanes of traffic plus two parking lanes from one side of Main Street to the other was daunting and felt like crossing a major highway in the middle of the historic downtown. Working closely with project Engineers, McFarland Johnson Associates, and the City of Concord, CRJA developed a design strategy for the historic Main Street that would transform the existing transportation corridor into more of a “Complete Street”, accommodating pedestrians, drivers, and transit users in equal measures. An intensive and interactive community participation process set the foundation for the project’s goals. 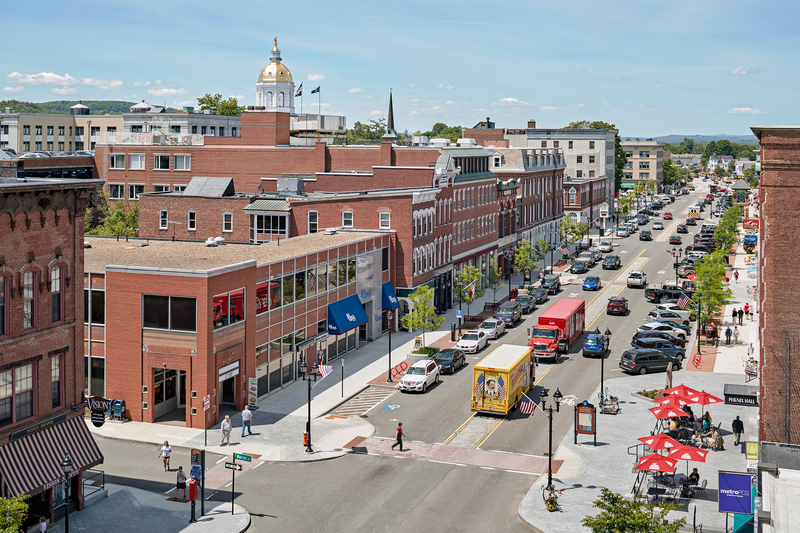 One of the main goals of the revitalization project was for the streetscape design to serve as a catalyst for the regeneration of Concord’s retail core. Another key improvement goal was to address the problems of pedestrian accessibility both along the street and at entrances into the existing buildings. 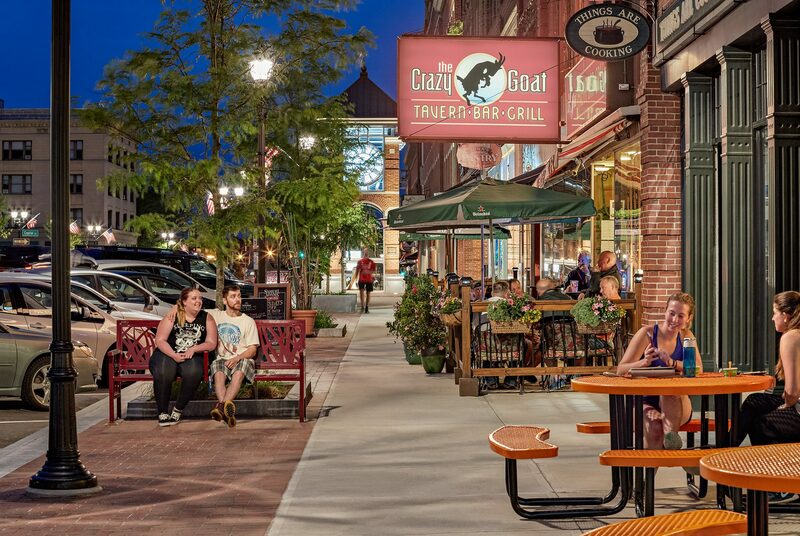 By addressing both of these goals through thoughtful design, the team was confident that people would return to this formerly robust Main Street and give the local retail community a much needed boost. 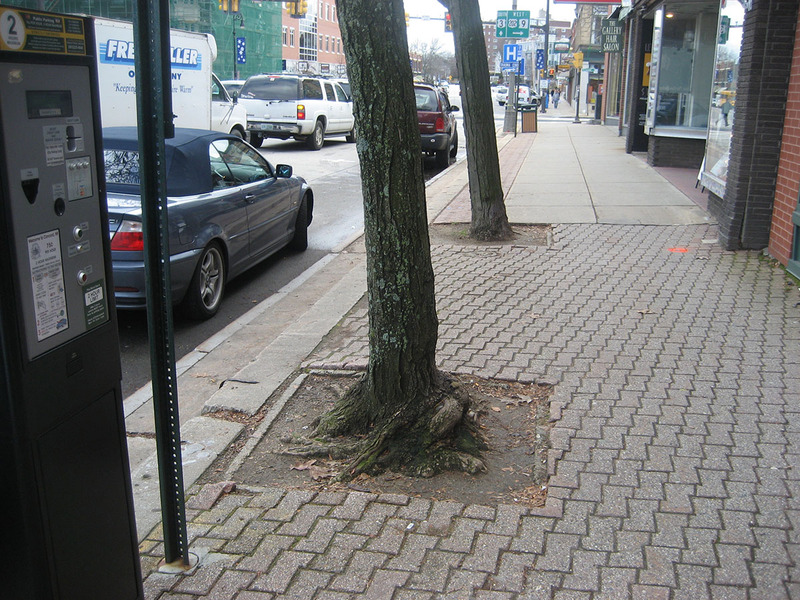 These goals were achieved through a variety of streetscape improvements. The most significant of these was narrowing the street by reducing the vehicular travel lanes from four to two. This critical change, called a “road diet”, afforded wider sidewalks on both sides, thus accommodating the projected increase in pedestrian traffic. The wider sidewalks were enhanced with all new lighting and the installation of 100 new trees with accompanying perennial plantings, which provide texture and vibrant color to the sidewalk. Along with the benefits of improved air quality and storm water absorption, the new street trees provide shade, shelter and enhanced atmosphere for pedestrians and visitors befitting the State’s Capital City. 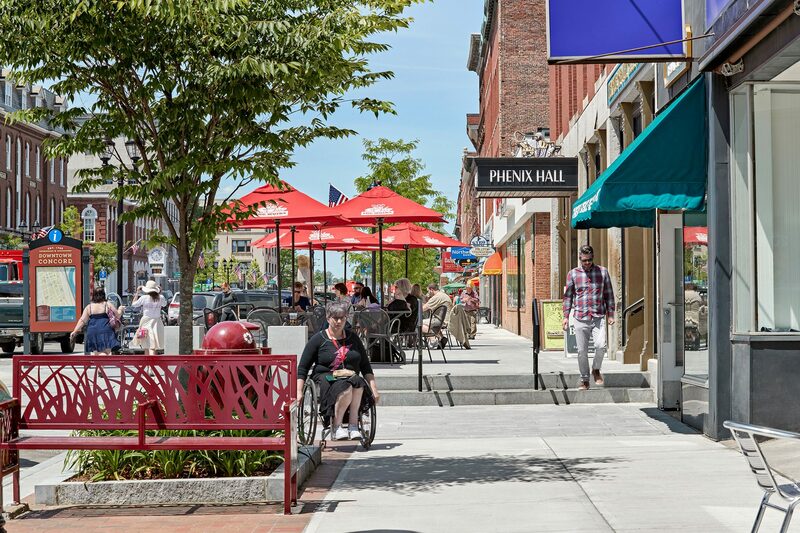 Local N.H. granite was used in the streetscape for paving stones and for custom designed seating. To improve overall access and circulation, additional street crossings were implemented. Gathering spaces with a variety of seating are located along the street. These spaces also create areas for future installation of public art or outdoor dining and events. 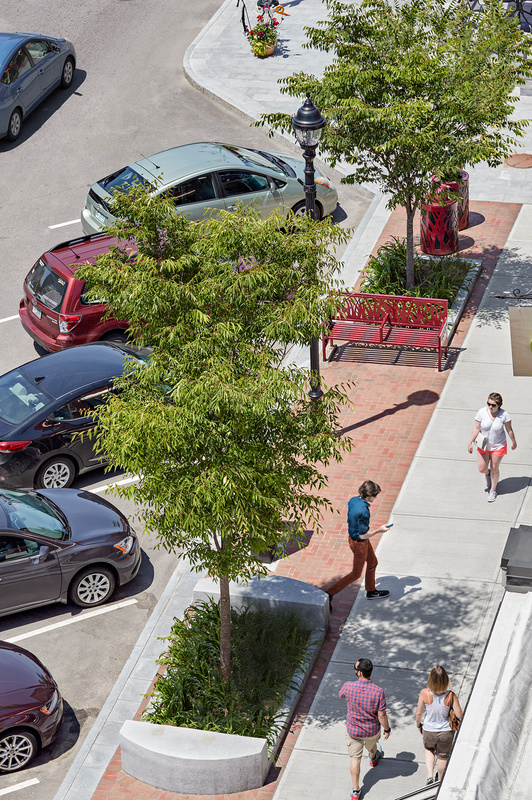 The combination of more ample sidewalks and new pedestrian amenities creates a welcoming, vibrant, and more interesting public space for the community. Universal access is now provided to all buildings along Main Street to make it inviting for all people. Before & After: The “road diet” enabled the widening of sidewalks, seen here. The wider sidewalks allowed for new custom seating and an improved pedestrian experience. Before & After: Businesses are now able to offer spacious outdoor dining, uninterrupted by sidewalk traffic. 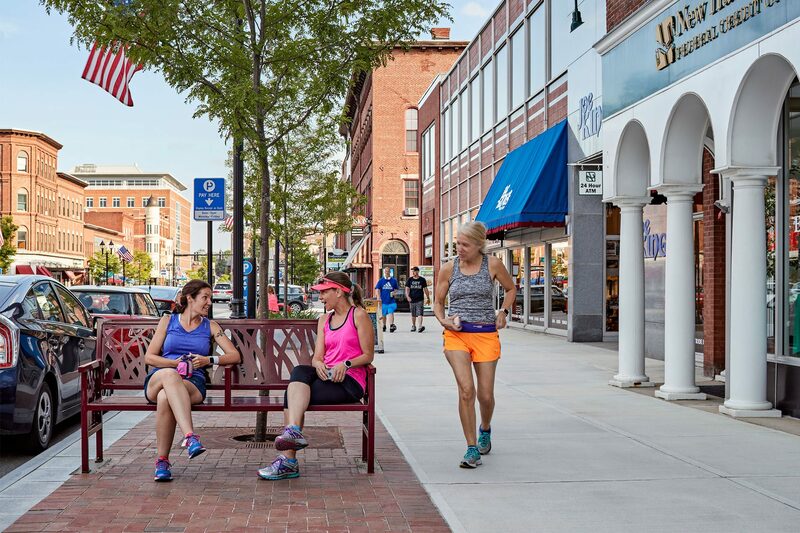 By creating an attractive, comfortable, safe and inviting setting which is a destination for residents and visitors alike, the improvements to Main Street have already had a positive impact on the economic vitality of downtown Concord. Main Street has become an integral part of the City’s open space system, and a common ground for the community as well as visitors to shop, dine and live. Since the North Main Street section was completed in late 2015, eight new businesses have opened and existing retailers have already seen an average increase of 10% in revenue compared to pre-construction sales figures. 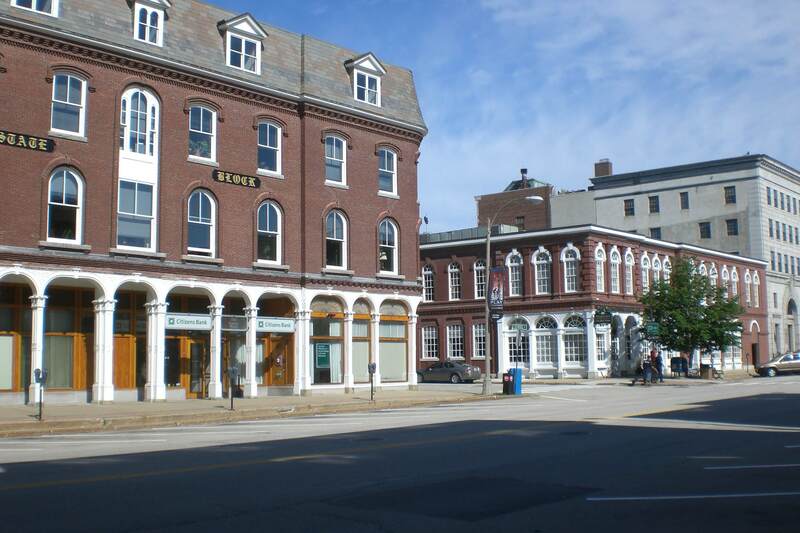 This project is an example of the success of Complete Street implementation, and has been recognized with several awards including the American Council of Engineering Companies (ACEC) New Hampshire Chapter- 2017 Engineering Excellence Award – Gold Award, the American Public Works Association’s 2017 Public Works Projects of the Year, and the New Hampshire Preservation Alliance 2017 Preservation Achievement Award.